DE consists of high frequency “electrical noise” that has become superimposed on your wires. It includes transient spikes from inductive loads like motors being switched on and off. Most of the published work on this uses the Stetzer Microsurge meter which measures noise between about 2 kHz and 120 kHz. Until now the only DE Meter available. dLAN network adapters also put RF signals on your mains wiring and it is good to switch them off at night. dLANs use frequencies above 150 kHz that extend up to several MHz and are not detected by some Dirty Electricity meters like the Stetzer. However, the NEW DE Meter we are about to launch (see below) will be able to measure these levels. It will measure DE from as low as 2KHz up to 10MHz. High speed/bandwidth (500 Mbps and faster) dLANs produce electrical RF noise up into the 100s of MHz. The Stetzer Dirty Electricity Meter (described above) measures the current in a 800 picofarad capacitor connected across the terminals of the outlet into which it is plugged. One GS unit is .02 micro amperes. A meter reading of 50 would indicate a current of one microampere. The frequency band covered by the Stetzer Dirty Electricity Meter is about 10 kHz to 120 kHz. If only one frequency sine wave is present, the meter reading is 0.24 times the rms voltage in millivolts times the frequency in kilohertz. In current terms, one GS unit is equal to .02 micro amperes. 900 GS units would be equal to 18 micro amperes. However, our brand new a brand new DE Meter supersedes the Stetzer Meter, measuring DE from as low as 2KHz way up to 10MHz. This unit also offers before DE Filter and after fitting DE Filter readings whilst also showing the percentage reduction in levels of DE achieved – see below for more details. 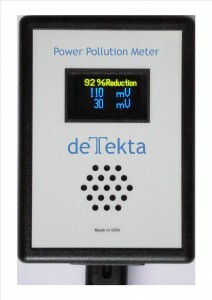 Power Pollution Meter – Built with your Health & Safety in mind! You can listen to the amount of dirty electricity on a circuit when the DE Meter is plugged in. (Similar to listening to microwave radiation levels when using the Acousticom 2 or the Acoustimeter Microwave Monitors. ) Hear the ‘noise’ decrease when you install the DE Filter/s. Makes the correct placing and siting of the DE Filters very easy when trying to discern the best position (sockets) to obtain the maximum results possible in reduction of dirty electricity. Fitting a few “Electropulse Filters” (or Dirty Electricity Filter) in your house helps reduce the Dirty Electricity, by lowering high-frequency noise on your house wiring. They plug in (and occupy) a standard 13A mains power socket. Recommendations: We suggest a maximum of one-per-room and, in the first instance, probably just starting with two or three for the whole house. Typically a small Flat with one Socket Circuit would only require two DE Filters. A typical house with an upstairs and two Socket Circuits would require three DE Filters: two for the downstairs circuit, one in Lounge because this is generally where most of the electrical equipment is, and one in Kitchen. The third one is for the upstairs socket circuit. A larger house, one with more than two socket circuits, would require one more DE Filter for each extra socket circuit. Though always be guided by the DE Power Pollution Meter to determine the best results, number and positioning of the Filters. Please note these DE2 Filters are an update to the old DE1 Electropulse Filters and that contrary to what some other sites say, you do not need 10-20 DE Filters in a house! In fact this many would be counterproductive and may make the situation worse. Our Electropulse Filters (DE Filters) are manufactured in the UK and are designed to cope with our higher voltage system of 230-250v. Rather than being based on the US 110v system that other DE Filters are based upon. Houses that are badly affected by DE would generally have GS Levels (measured in mV) in the 400s/1200s, and even higher in some cases, up to 1800. The use of the DE Filters is designed to reduce these DE Levels (spikes of bad energy/information if you like) down to a more natural 40-60mV. Which is what you would expect from a 50-60Hz 230-250v system like the one we have in the UK. That is exactly what the DE Filters manage to achieve, with only 2-4 Filters. You DO NOT need to use more Filters than this, unless you have extremely bad levels of DE coming into your hole through the power supply. With our brand new DE Meter you would be looking to reduce DE Levels to around 100mV or lower with the use of DE Filters. How To Use: Simply plug in the Filter and if the socket has a switch, switch it on. The Filters do not consume any power, though they do need to be ‘connected’ to the electricity to work, so your utility bills will not be affected. **Please note that they don’t lower the power frequency electric fields created by house wiring, only the high-frequency noise between the 230 volts phase and the neutral. Technical detail: The unit contains a 15 microfarad a.c. mains-voltage rated capacitor and discharging resistors. The units are fully approved to European safety standards and are internally fused and shielded, unlike others on the market. Please note that these are fitted with a UK style plug, and will require a socket adapter to be used in many other countries. You do not require an earth pin on your system for the filter to work correctly.